Wayne is sitting 2nd in the championship and heads to Winton Motor Raceway. Watch all the action live Sunday from 9.45am. 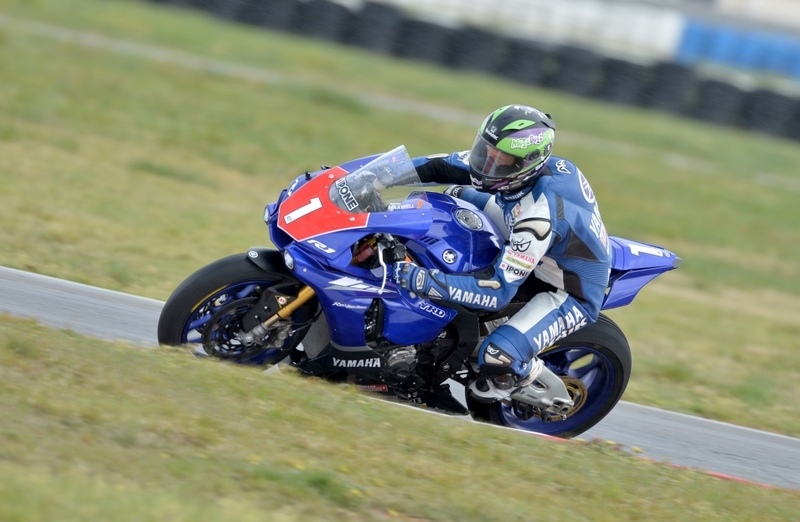 The Yamaha Racing team claimed second and third positions on the podium at round five of the Australasian Superbike Championship contested at Wakefield Park, over the weekend. Glenn Allerton and Wayne Maxwell turned in spirited performances throughout the event to capture second and third respectively, while Cru Halliday battled all weekend fighting of the effects of crashing in the lead up to Sunday’s event. Glenn Allerton continues his recent return to form posting second overall with his 2-1 4 results in the three championship races. Allerton, winner of the previous round, has showed constant improvement throughout the year as he adjusts to the new Yamaha R1 and is now in good form and a contender every time they grid up. “All in all, it was a good weekend for me,” Allerton offers. The first two races went exceptionally well and I was confident I could finish the day strong but a bad start in the last moto meant I was back a little bit and trying to pass my way forward. “I was probably a little frustrated in that last one as I wasn’t making up ground for a few laps and saw the leader getting way. I was able to make a bit of charge at the end, but it was too little, too late. “Still, it feels good to be back up the front and challenging for race wins again. Team bike was good all weekend and the team did a great job. I can’t wait for the next round,” Allerton ends. Wayne Maxwell logged a consistent weekend of racing his way to third overall with 3-4-3 results but was disappointed he couldn’t make a challenge on the championship leader. Maxwell was always close to the race leaders but couldn’t take advantage of his good track position and turn them into race wins. He currently sits second in the championship chase, 16 points behind leader, Troy Herfoss. “Just a so-so day for me. I lost a few points in the championship so that isn’t great but it’s not over and 16 points can be made up quickly if things go my way but it will be a long, hard battle. There are two rounds to go, so I have to refocus and pour the pressure on at the next round,” Maxwell said. Unfortunately, Cru Halliday had a weekend he would rather forget. Cru fell twice on Saturday leaving him not only battered and bruised, but also a long way down the grid for the three races on Sunday. He fought on as best he could but could only manage eighth for the round and is already making plans for round six at Winton. “The weekend was a shocker for all round. I had a couple of crashes that shook my confidence on Saturday and then I just wasn’t on the pace on Sunday so its best I just put this behind me and prepare for the next round. “We have a test coming at Winton shortly and as we haven’t ridden the new R1 there, it will be important in gathering information on the bike and coming up with a good setting for the round there. It will be a better round for me,” Halliday ends. Round six of the Australasian Superbike Championship hits Winton in Victoria on October 24-25 and it will prove to be a pivotal round in the championship chase for the Yamaha Racing Team. Having a second row start was not ideal to claw back some championship points. Wayne got a reasonable start and held his fifth position on lap 1, then on lap two he passed two riders and held third place for the remainder of the race. This was a great result with Wayne still suffering arm pump, so to gain some championship points on Herfoss and also be on the podium was a good start to what has been a tough weekend for the multiple champion. This race was filled with a few drama’s, Wayne was in 4th position when his teammate Cru Halliday crashed of which the race was red flagged. The restart saw the Yamaha’s start from pit lane of which Wayne had to go through the field in the 6 lap dash. After the combined times Wayne finished in 3rd position and closed in on the championship lead. The weekend was not the best, but to claw the championship back to just 3 points behind Herfoss was a great result on Sunday.